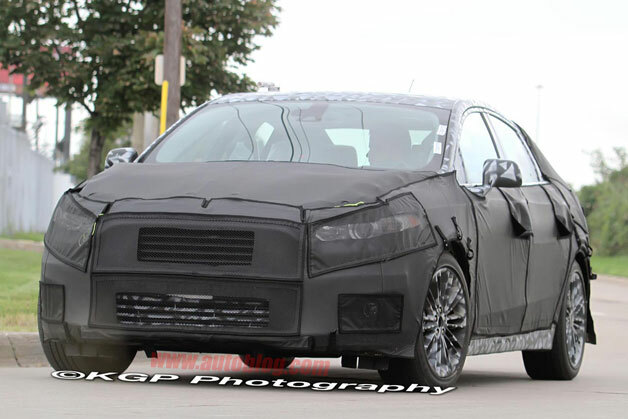 Our spy photographers have snapped a glimpse of the forthcoming 2013 Ford Fusion. The Mondeo-based sedan looks to have lifted lighting inspiration from the Ford Evos Concept that the automaker debuted at this year's Frankfurt Motor Show. With thin, slit-like projection lenses and a very vertical grille, the 2013 Fusion looks to bring quite a bit more attitude to the table than the current model. Right now, the Fusion is built in Mexico, but there's some indication that the model may shift to a U.S. plant in the near future as part of the current negotiations between Ford and the United Auto Workers. At this stage in the vehicle's development, it's unclear exactly what Ford will offer in terms of powertrain options or what the inevitable hybrid variant will bring to the table when it arrives. We are told that Ford will likely show off the first real look at the 2013 Fusion at January's Detroit Auto Show. Stay tuned.